"The Beatles, Sgt. 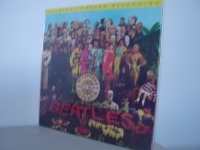 Pepper's Lonely Hearts Club Band"
MFSL JVC Super Vinyl, voted the #10 album of all time "Out of Print The album, which has sold over eight million copies, stayed at No. 1 in the album charts for 15 consecutive weeks and features 13 tracks, including the title cut, "With A Little Help From My Friends," "Lucy In The Sky With Diamonds" and "A Day In The Life." Other Tracks Include: "Sgt. Pepper's Lonely Hearts Club Band" "Getting Better" "Fixing a Hole" "She's Leaving Home" "Being for the Benefit of Mr. Kite" "Within You, Without You" "When I'm Sixty-Four" "Lovely Rita" "Good Morning, Good Morning" "Sgt. Pepper's Lonely Hearts Club Band" "Day in the Life"